The question of providing a proper place for the care of our paupers became important. The matter was submitted to the voters of the County at the election in 1859. The County Commissioners purchased the Adams farm, containing 320 acres, at $65.00 per acre. 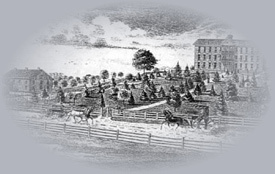 Building the Infirmary proceeded slowly due to the Civil War and the lack of funds. 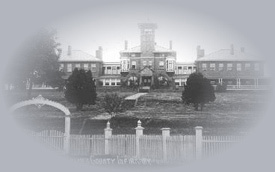 The building was finally completed in 1867 at the cost of $24,000. Louis Mayers, John Sharp Sr. and Lewellyan Allison were the first directors. William Barton was the first Superintendent. He served from 1867 to 1870. His annual salary was $600. On March 17, 1895 the building caught fire and burned. The fire was thought to have started from the cook stove. All the residents were removed safely. In January 1896, a new modern building was completed at a cost of $28,000. It took 250,000 to 300,000 bricks to build the Infirmary. The bricks were all made at the yard on the Infirmary farm. The barn, the cave, and paving with bricks around the Infirmary was done in 1897. Total cost of the Infirmary and barn was $44,000. On July 9, 1919, the name was changed to the Holmes County Home. 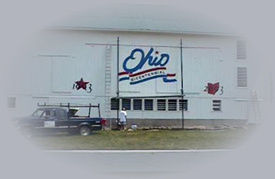 Artist Scott Hagan applied the Ohio Bicentennial logo to the broad side of the barn at the Holmes County Home, it is 47th of the 88 that will represent each of Ohio's counties.